Police are hunting for two men who carried out a "cowardly attack" on a Denbighshire nightclub owner as he arrived home for the evening. 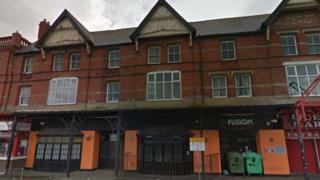 North Wales Police said the pair were waiting for the businessman after he left the Fusion club on Rhyl's West Parade on Saturday. They demanded money from their victim after confronting him at Violet Grove in the town at about 04:30 BST. The nightclub owner needed hospital treatment as a result of the assault. "This was a cowardly attack on a local businessman. It is fortunate that he has not sustained more serious injuries," said Det Insp Chris Bell. Officers said they want to speak to anyone who may have any information about the attack, or who saw people acting suspiciously outside the nightclub or Violet Grove at the time.